The Wilson Student Team Project Center is the location for the production and development of many student projects, including the Solar Car, Formula SAE, and Concrete Canoe teams. Due to an increase in participation and the number of student teams, the center requires additional space for project teams currently housed off-campus. 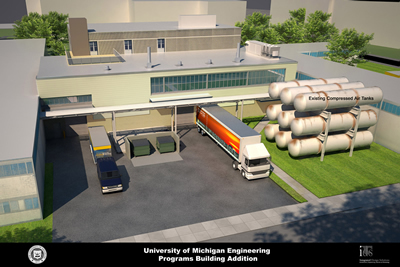 A 10,000 gross square foot addition will be constructed on the east side of the Engineering Programs Building. The addition will be a flexible workplace that facilitates design, construction, and student interaction in a collaborative setting.